What these two KPIs have in common is they broaden the focus beyond just selling new seats. Clearly that has to be done, but long-term success requires you to land and expand, not just land. That creates two distinct sales processes–the process of getting the customer to buy their initial seats, and then the process of getting them to utilize those seats, derive value and expand. There are always metrics and KPIs around the landing part, but the expanding part often gets overlooked. For a SaaS business that can be deadly. Salespeople are usually going to focus on whatever is easiest and whatever their comp plan incents them to do and they’re done. Measuring time to money ensures that what gets sold gets used. Otherwise, the expansion opportunity doesn’t exist. It’s common to measure different phases of the sales cycle. How long is it from when the lead comes in to when it becomes an SQL, sales qualified lead? How many touchpoints are there along the way? How long does it take to go from SQL to closed/won? How long from closed/won to go live? But, that’s not enough. If you look at each one of these processes individually and through the lens of a traditional stages-and-ages sales reporting methodology, you may not see an issue. In a transaction oriented business, you’ve got to get the customer to go live before you start making your money. But go-live does not equal run rate. Time to money is really time to run rate. Even if your revenue isn’t derived from transactions, go live should never be seen as the endpoint, because the margin is usually in the expand. Go live is just an indicator that an expand opportunity exists. It’s that last layer, from go live to run rate that takes us to where the money is. You can break this down into the key milestones so you can improve the process. How long did it take to process a certain minimum number of orders? How many of certain key API calls is the customer making? How fast are orders and API calls ramping? How long to run rate? Looking at the aggregate duration of the whole process, we can start to determine what I call the long pole of the tent, and feed that information back into the business. For example, what API calls were being used in the deals that took the longest to go live? Are there things we could do to expedite that process? 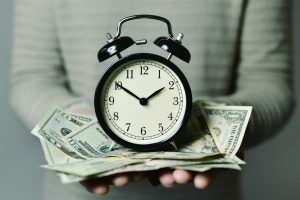 The great thing about measuring time to money is not just the information it gives you, but the behavior it drives. The marketing team is focused on the time from lead to SQL. The sales development team is focused on SQL to closed/won to go live. The success team is focused on taking the customer from go live to achieving their run rate. Each leg of the process has an individual owner, but as a company, time to money makes you pay attention to the whole system and constantly try to find ways to shorten each one of those steps while building customer value through the entire process. In sales, it allows you to shift from saying, “Okay, I need 10,000 new customers,” to “I need new customers similar to those that have the shortest time to money.” Fewer customers that can move through the process as quickly can have a bigger impact than a whole lot of customers who for whatever reason, are going to be slow to go live and ramp up, this ties back to another post I wrote about the Ideal Customer Profile (ICP). What I’ve seen in too many SaaS companies is that sales people get these crazy comp plans and start selling anything to anyone so they can make their number. What ends up happening is a shotgun approach where they send out 100 bad cold emails a day where they get everyone’s name and title wrong. We’ve all been on the receiving end of that. That may turn up some deals, but the reality is some of the people they’re selling to either don’t have a strong enough need or they have too many internal hurdles to overcome to get to run rate. Even if they buy, you’ll only ever get the land opportunity. You won’t get the expand opportunity, and you’ll keep increasing sales and marketing costs chasing prospects that are never going to hit their goals, much less become a reference or evangelist for your product. If companies really start to look at time to money, what they’ll find is they don’t need to do shotgunning. They need to focus on their ideal customer profile. Those are going to be your most profitable customers, probably because they move through the process and start generating revenue quickly. If they do that, what they’ll find is they don’t really need as many new customers, and we will stop getting all these stupid emails.